^ The Pentagon – George Bergstrom – Great Buildings Online. Greatbuildings.com. [2008-10-26]. （原始内容存档于2008-10-15）. ^ Intro – Secretaries of War and Secretaries of the Army. United States Army Center of Military History. 1992 [2008-10-17]. ^ Main Navy & Munitions Buildings. Naval History & Heritage Command. [2008-10-17]. ^ General Information. [December 4, 2005]. ^ Vogel, Steve. How the Pentagon Got Its Shape. Washington Post. May 27, 2007: W16 [2007-05-26]. ^ Roig-Franzia, Manuel. Hemp fans look toward Lyster Dewey's past, and the Pentagon, for higher ground. The Washington Post. May 13, 2010 [May 25, 2010]. ^ McGrath, Amanda. How The Pentagon Got Its Shape (Gallery). The Washington Post. May 26, 2007. ^ Owens, Jim. Replacing the stone and rebuilding the Pentagon. Mining Engineering. February 2005, 57 (2): 21–26. 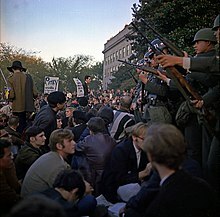 ^ White, Jean M. 2500 Women Storm Pentagon Over War. Washington Post. 1967-02-16. ^ Auerbach, Stuart. Pentagon Protesters Jailed. Washington Post. 1967-05-13. ^ Flowers, Guns and an Iconic Snapshot. The Washington Post. March 18, 2007 [May 25, 2010]. ^ Jacobs, Ron. The Way the Wind Blew. Verso. 1997: 142. ^ Flight 77, Video 2. Judicial Watch. （原始内容存档于2009-02-12）. ^ Isikoff, Michael; Daniel Klaidman. The Hijackers We Let Escape. Newsweek. June 10, 2002 [Oct 22, 2009]. ^ 35.0 35.1 Schrader, Esther. Pentagon, a Vulnerable Building, Was Hit in Least Vulnerable Spot. Los Angeles Times. September 16, 2001 [Feb 25, 2010]. ^ Pentagon Renovation: Renovation Program Had Hardened the Facade Attacked on 9/11/01. 9-11 Research. [2010-02-25]. ^ The Pentagon. globalsecurity.org. [2010-02-25]. ^ Pentagon Renovation Program. [December 4, 2005]. （原始内容存档于2006年5月8日）. ^ Childs, Nick. Americas: Pentagon staff reclaim destroyed offices. BBC News. August 15, 2002 [December 4, 2005]. ^ Pentagon History – September 11, 2001. Pentagon.afis.osd.mil. [2008-10-26]. （原始内容存档于2008年12月11日）. ^ Christy Goodman and Maria Glod. Gunman sought in Pentagon shooting. Washington Post. October 20, 2010: B1. Goldberg, Alfred. The Pentagon: The First Fifty Years. Office of the Secretary of Defense / Government Printing Office. 1992. Vogel, Steve. The Pentagon – A History: The Untold Story of the Wartime Race to Build the Pentagon and to Restore it Sixty Years Later. Random House. 2007. Carroll, James. House of War: The Pentagon and the Disastrous Rise of American Power. Mariner Books. 2007.